A bright full moon was added as a gift during Christmas holidays the last one of the year, marking the time when the nights are long and dark. 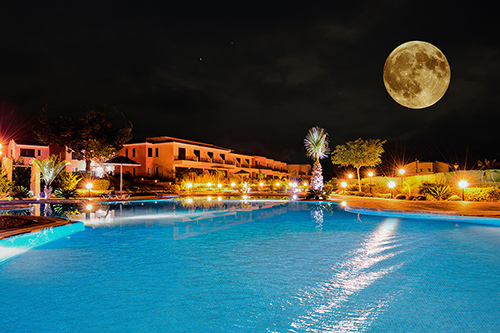 Leptos Aphrodite Gardens the top selling project in Cyprus for the year 2015, enjoyed that magical moment with the moon peacefully reflecting in its large swimming pool creating beautiful and emotional abundance. The exclusive "Leptos Aphrodite Gardens" is set to be the most luxurious gated resort residence in Paphos with a very good selection of 1, 2 and 3 bedroom apartments, penthouses and villas for sale. It is superbly located in the touristic area of Kato Paphos within walking distance to the amenities and facilities, the luxury five star hotels and the municipal sandy beaches. The area also offers a great investment potential due to its proximity to the planned Leptos "Neapolis Smart Eco City" Project; A major infrastructure project that is scheduled to include; a University, Hospital, Cultural and Entertainment facilities, residential properties, retail and business services. The Leptos Aphrodite Gardens comprises of 6 three story buildings with luxury apartments and penthouses as well as 60 superb villas which are surrounded by two large free form swimming pools and landscaped gardens. 70% of the site area is allocated for public, common, private gardens and patios with extensive planting and landscaping including ponds, irrigation system, footpaths and sundecks. The site is also advantageous because it has Public green areas or parks on all 4 sides.